Watch the two-hour documentary, "The Dropout," THIS FRIDAY, March 15, 2019, at 9 p.m. on ABC. This is episode 6 of "The Dropout," a six-episode ABC Radio podcast about the fall of Elizabeth Holmes' startup Theranos. If you haven't listened to episode 1, episode 2, episode 3, episode 4 and episode 5, we advise that you do so first. By September 2018, Elizabeth Holmes's company Theranos had dissolved and the once-celebrated Silicon Valley wunderkind had pleaded not guilty to federal criminal fraud charges. A trial date has not been set yet, but if convicted, she could face decades in prison. The news of Holmes' downfall ricocheted throughout the tight-knit community in Houston -- a place the Holmes family once called home. "We knew her, and the shock and sadness of watching it all play out has just been huge for the community," Megan Long, a former classmate of Holmes, told ABC News' Rebecca Jarvis on "The Dropout" podcast. Long first met Holmes in 1995 when they started sixth grade together at St. John's School, a private school in Houston where some of the wealthiest families in Texas send their children. "[People were saying], 'Oh my god did you hear about Elizabeth?' 'Oh my God. Her company is dissolving.' 'Oh my gosh, she's facing criminal charges.' 'Oh my God, I feel so bad for Elizabeth," Long recalled. Long reached out to Jarvis after listening to the first episode of "The Dropout." She said she wanted people to hear about the polite, engaging Holmes she knew growing up. Of all her memories of Holmes, Long said there was one that really stood out. The girls were on the track team -- Long a sprinter and Holmes a distance runner. To this day, Long said she still remembers who would always come in last place during races. "Everyone would finish the race, and then all of a sudden you hear the announcer say, 'Don't cross the track, there's still a runner on the track.' That runner was Elizabeth," Long said. "But sure enough she was not deterred by people laughing or people crossing the field, she was going to run that race and finish it, and she was determined to do it no matter what anybody said." Holmes' determination as a student seemed to mirror the perseverance she would later exhibit creating and leading Theranos. Long said that "the bully" some former employees have described Holmes as "is not the Elizabeth that I knew growing up." St. John's School opened its doors in 1946 and has a longstanding reputation for excellence and producing high achievers. Holmes was no exception. Long said that throughout high school, Holmes always appeared to move through life with a purpose, less interested in socializing, more "intent on doing her work." Holmes opted to not attend school dances or interact with friends during free periods, Long said. "She was always very disconnected from the larger group of girls or just kind of in her own world," Long said. "Elizabeth was either working on her dissertation or maybe she was learning her Mandarin or she was learning to program. ... But she was always very intently pursuing something else." Long said that the Holmes family kept to themselves. She remembers Holmes' mother Noel as "pleasant and charming." She recalled rarely seeing Holmes' father, Christian Holmes, at any school functions or community events. But Long said Holmes shared one fact about her family tree. "The only thing Elizabeth told me about her family is that ... [actor] Lorenzo Lamas was her step-uncle because her grandfather married his mother, who was a Hollywood actress," she said. After high school, Long says that she didn't hear from Holmes, that Holmes wouldn't go back to Houston for any of the "mini-reunions" their class would have nor keep in touch with classmates. It wasn't until Holmes appeared on the cover of Forbes Magazine in 2014 that her high school class learned of her accomplishments. "That was the first time that anybody had heard anything about Elizabeth since graduation. ... I was so proud because, you know, this is Elizabeth that I grew up with. And I was shocked, because I was like, 'Where have you been? Like we haven't heard from you, we haven't seen you.'" It wasn't the only new thing that Long learned about Holmes. She said she was surprised by Holmes' voice during the interviews she saw. "[In high school] her voice was always going up and down in terms of the pitch, of high and low. So it was very nasally and it would vacillate with high and low, so when she would talk to you it would go up and down," Long said. "It wasn't a very clear pitch as to whether it was distinctly high or distinctly low. So when I've seen videos of her, her voice was really low. I was like, 'Wow her voice got really deep.'" According to Long, in high school, Holmes was nice and reserved, somewhat detached, with a family connection to the soap star Lorenzo Lamas -- not the person Long said is the woman the public knows today. "It's a very big shock to the St. John's Community and big sadness in our hearts that this is how it all played out," she said. Clinical and performance psychologist Dr. Jonathan Fader, who frequently works with CEOs, professional athletes and entrepreneurs, said when people fall into stressful situations it's possible for people to do things that would be considered out of their character. "It's not impossible that, in my mind, any of us when exposed to certain situations could make poor choices," he told Jarvis. "I'll say it's unlikely that someone who doesn't have the wiring to do it at all would make those poor choices, but I'm sure it is possible." Fader has not evaluated Holmes but said sometimes successful leaders can be blinded by their ambitions and lack self-awareness. "One of the things that we see in leaders is they tend to be in some way somewhat narcissistic," Fader said. "An excellent leader is someone who's able to really have a high level of self-confidence, and there is a very thin line between self-confidence and arrogance." "It's a fine line for being able to ignore things that are important to other people, like feelings or consequences," he added, versus "doing it so much that you're putting yourself or other people at risk." Fader says sometimes success at a young age does breed confidence but can also hinder someone from developing other leadership skills, such as "empathy, social skills, the ability to be self-aware and self regulate." Long said it's still difficult to make sense of how her former childhood classmate got this far and now could be going to prison. "Sometimes people have to learn lessons in life, and it's hard if those lessons are really difficult," Long said. "This is how her cards have been dealt, and I wish her the best and I hope that it all works out." Holmes is charged with two counts of conspiracy to commit wire fraud and nine counts of wire fraud. According to the indictment from the U.S. Department of Justice, the charges are a result of allegations that Holmes engaged in a multi-million-dollar scheme to defraud investors, and a separate scheme to defraud doctors and patients. If convicted, Holmes could face a maximum sentence of 20 years in prison and a fine of $250,000 for each count of wire fraud and for each conspiracy count. "I think depending on how the trial goes and depending on how strong the evidence is and depending on whether or not she testifies, I would be surprised if she got less than 10 years, but I've seen in cases like this that are very substantial," Preet Bharara, former U.S. Attorney for the Southern District of New York and host of NPR's "Stay Tuned with Preet," told Jarvis. Bharara has researched the Holmes case and spent years litigating high profile criminal and civil cases. He says that the proof against her "seems overwhelming." "I think she will be convicted, and I think her best bet is to plead, given what I know about the case, and how she might be perceived by the jury," Bharara said. Bharara said that it will be important for Holmes to show that she was trying to make the Theranos technology work as she promised. "Unlike some other fraudsters that my office prosecuted, like Bernie Madoff for example, Bernie Madoff was a fraud through and through ... there was never a thought in his head that later I'll make some money back another way and I'll pay everyone back. It was a true Ponzi scheme. I'm not saying that carries the day for her at all, but she's in a slightly different circumstance," Bharara said. But Bharara doesn't necessarily think that alone will be enough for Holmes to beat the prosecution. He said if she can show positive intent to accomplish something revolutionary it will only be a "minor point in her favor." "You usually don't make precise and specific allegations of the type in this indictment unless you can back it up," he said. "People forget this, motive is not really relevant to guilt. ... You have to prove that the person intended to do it, but doesn't matter if the reason was power or fame or greed. It doesn't matter." And while Holmes may have had noble intentions, Bharara said he expects she will be held accountable. "You really can't toy with people and their health and their emotions that way," he said. "You can see jurors becoming very angry at how she raised people's hopes falsely." Former Theranos president and COO Ramesh "Sunny" Balwani, who also was Holmes's boyfriend of many years, is facing the same federal criminal charges, but Bharara said he could be in a better position than Holmes. 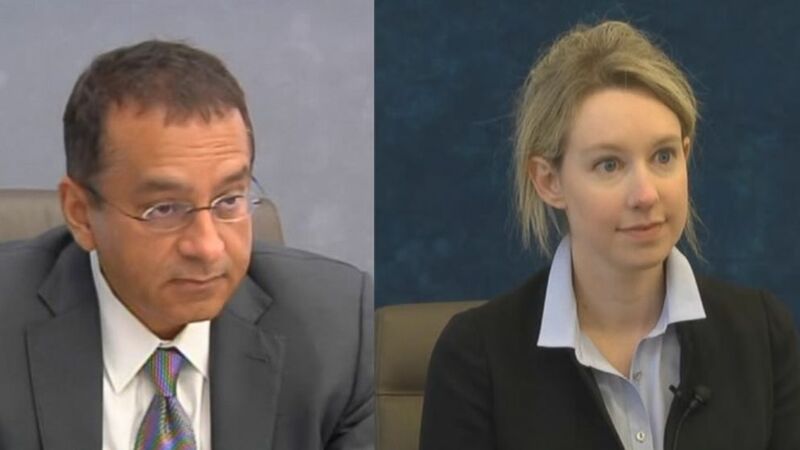 Balwani's lawyer Jeff Coopersmith told Jarvis on "The Dropout" that Balwani does not feel that he was "duped by Elizabeth Holmes" but rather "believed in Elizabeth Holmes and her vision for the company. He tried to execute that plan with her to make it a success." Coopersmith said Theranos was a "business failure" and "not fraud." But Bharara said it isn't uncommon to see people change their defense. "Even though right now Sunny and Elizabeth Holmes seem to be in sync with each other, that can change," he said. "Former boyfriends and girlfriends flip on each other." Throughout her deposition with the Securities and Exchange Commission, one federal entity bringing charges against Holmes and Balwani, Holmes claimed ignorance to the ongoings at Theranos. She said "don't know" or "can't remember" more than 660 times. Bharara said that type of defense for a CEO can be "problematic." Holmes presented herself as knowledgeable and sophisticated. She was also the only person who regularly spoke on behalf of the company publicly. "She was involved deeply, strategically, substantively in every aspect of the business and how the prototypes worked or didn't work," Bharara said. "She personally sought out the investors, she personally sought out people who would be on the board ... for her, being incredibly smart and being incredibly educated and incredibly sophisticated is harmful." Bharara said he would advise Holmes to plead guilty. "The good lawyer says, 'Look, you're still a fairly young person. You have a whole life ahead of you. Everyone gets a second chance in America, hopefully. And you want to minimize the amount of time that you were denied your freedom, and here's how powerful their case is, here are the defenses we could make,'" he said. "I think you have to have a conversation like that because trials are tough." If convicted, Bharara believes it's highly likely Holmes will face significant prison time. "Elizabeth Holmes and her erstwhile boyfriend, Sunny, are only guilty if you can prove beyond a reasonable doubt that they intended to lie, that they intended to mislead," he said. The legal fate of Holmes and Balwani will not be known in the imminent future. There are more than 16 million pages of documents in the case, and processing those was delayed earlier this year because of the federal government shutdown. Both Holmes and Balwani are scheduled to appear in court in San Francisco on April 22 for a status hearing. In the meantime, Holmes has been living in San Francisco. Former Theranos senior software engineer Michael Craig says he crossed paths with her over Martin Luther King Jr. weekend this year while he and he wife were having cocktails at a bar in Sausalito, California. Craig said that it was "surreal" because he never thought that he would run into his former boss again. "She was dressed in like a dark hoodie and jeans and didn't look to have any makeup on," he said. "She looked very young and a little bit slight, her posture was a little slumped over and she was staring right at us. And then she got up and came over, and we stood up, and I was completely taken by surprise." The last time Craig had spoken to Holmes was in 2017, his final day at Theranos. He'd been let go as part of a company restructuring. "She came over and gave us both a big hug and started asking about us and introduced her friend as her fiance and we shook hands, and it was just really weird," he said. Holmes's fiance is an MIT graduate whose family owns a successful hospitality company. He studied economics and works in technology in San Francisco. He's eight years younger than Holmes. "He reminded me a lot of the Duke boys that were at Theranos," Craig said. "Short cropped hair, handsome guy, pretty, you know, outgoing." Craig said he was caught off guard, when he said Holmes brought up Theranos casually, ignoring the fact that she was facing federal charges. He said she never acknowledged that she was facing possible prison time nor that she had allegedly lied to so many people, including him. "There was no apology or anything like that," Craig said. "There was no stability extended in anything she said. I just thought that was upsetting that this is somebody who claimed to have integrity and to be promoting transparency and the reality is, neither one of those is true was true." He felt that the leader he once revered was gone. "This is the woman who had been on all these magazine covers -- she used to walk around with such an air of confidence and certainty -- she seemed a little bit worn down but she didn't seem like somebody who had done anything wrong," Craig said. Craig said he and his wife made an excuse to leave and that he was shaken from the encounter. He'd dedicated five years to Theranos and fully believed in Holmes and the mission of the company. Seeing Holmes again brought up a lot of emotions. "This is someone I almost worshiped here as like a guru of technology and business, and then to have that glass shatter of that illusion held up of her was traumatic," Craig said. "I just started to realize that there's a lot of stuff I haven't dealt with in terms of the impact that that whole experience has had on me." Craig said if he could ask Holmes one question he would want to know whether "it was intentional" or did she "just screw it up." He said he suspects both are true to some degree. "It is wanting something so badly that you're just going to do whatever means necessary. Take whatever actions you needed ... because you're so convinced you're going to get there in the long run," he said. Questions still linger for many of the people who got caught up in Holmes' world, like Ana Arriola, the product designer who left Steve Jobs' Apple to work at Theranos in the early days of the company. "Steve [Jobs] really coined 'the reality of the distortion field'" she said. "That's when said individual believes implicitly that what they are saying is emphatically the truth, that everyone else believes it to be the truth." Avie Tevanian, Steve Jobs' former right hand at Apple who originally invested $1.5 million into Theranos and for a time served on its board, wonders if they all fell, just a little bit, into Holmes's distortion field along the way. "We had a situation here that created what's called FOMO, fear of missing out," Tevanian said. "Everybody before you has bet on this ... and then you combine that with this incredibly compelling story. You've got this really smart female CEO ... who's going to make herself super rich and who's going to do a wonderful thing for the world. Right? It is a great story. You want it to work. We all want that to work." Tevanian said the "FOMO culture" is inherit to Silicon Valley. "It's almost a legitimate strategy to invest behind other successful investors just because they'll have the momentum," he said. According to clinical and performance psychologist Dr. Jonathan Fader, a groupthink mentality is even part of human nature. "We'll do anything that we can to get away from uncertainty. ... And this is evolutionary," Fader said. "We're relieved when we have a narrative or a story that we can buy ... the best leaders can take even a poor message and turn around and massage it and dress it up in a way that really speaks to people." This is especially true, he said, when the person selling that story appears to be as remarkable as Holmes. "If you have a compelling, charismatic person who can talk in a way that can pull at the underlying values that people have and can make them feel safe and that we're headed in the right direction," he said. "Even a message that lacks data or is somewhat flawed can be accepted." Many of Theranos' high-profile investors and board members were dazzled by Holmes' narrative, accepting "trade secrets" for lack of evidence or concrete proof that Theranos technology actually worked and existed the way it was being sold to them. Only when a then-25-year-old whistleblower, Tyler Shultz, started to raise concerns, ask questions and ultimately take action by filing a complaint and speaking to a Wall Street Journal reporter did Theranos' seemingly revolutionary claims start to fall apart. Shultz, whose grandfather, George Shultz was on Theranos' board of directors and a mentor to Holmes, said he risked his career and family relationships to speak out because of his concern for people's lives. When Tyler Shultz came forward in 2015, he said his grandfather, a former secretary of state, sided with Holmes and asked him to back down, but he refused. "I think that at the end of the day, everyone was concerned that we were not giving people the right results," Shultz said in a 2017 deposition for a lawsuit filed against Theranos by investors, obtained by ABC News and featured on "The Dropout." Tyler Shultz, who left Theranos in 2013, has since co-founded his own medical device company, Flux Biosciences, in San Francisco. His grandfather eventually changed his opinion. In a statement to ABC News regarding this report, George Shultz said: "The members of our family work to be loyal and supportive to one another and to the best of America's values. Most have inspired others to listen to their better angels; and some have shown tremendous courage and integrity when faced with difficult decisions or situations. Tyler's handling of the troubling practices he identified at Theranos is an example. He did not shrink from what he saw as his responsibility to the truth and patient safety, even when he felt personally threatened and believed that I had placed allegiance to the company over allegiance to higher values and our family. I have learned -- from my experiences beginning in World War II, in private industry, and in the various public service positions, I have been privileged to fill -- that the people in the field are closest to the issues and are the best sources of wisdom whenever a problem arises. That was certainly the case here. Tyler navigated a very complex situation in ways that made me proud. He has been an example for the entire family, for which all of us are grateful. I want to recognize and congratulate Tyler for his great moral character." Erika Cheung, a former Theranos employee, filed the complaint with the Centers for Medicare and Medicaid Services about the problems with quality control and proficiency testing she witnessed at the company, which ultimately led to Theranos' labs being shut down. She has also moved on with her life. She now works for a venture capital private equity firm in Hong Kong and said she's committed to growing the entrepreneurial ecosystem. "I hope that people don't get completely discouraged and think that everyone who is in the healthcare industry and the biotech industry is somehow out to get them and to hurt them. There are a lot of good people in this industry that really, really want to do good," Cheung told Jarvis on "The Dropout." She also encourages people "to be a little bit skeptical, a little bit critical of things that are really hyped up." It's exactly how Stanford Professor Dr. Phyllis Gardner was when Holmes originally approached her about an idea for a microfluidic patch when she was a freshman. Gardner became one of the earliest skeptics of Holmes. "I was not impressed with her knowledge, nor her ability to grasp complex information, [even though] a lot of people thought that she was brilliant," Gardner told Jarvis. Gardner, who continues to teach medicine at Stanford, hopes future generations of students will focus their energy on learning over monetary gain. "Without sounding too critical, it would be better if students would focus on service, humanities, arts and other things to broaden their minds rather than just focusing on becoming a multimillionaire by starting your company," she said. Gardner, like so many other women, said she was disappointed that Holmes, a rising female entrepreneur, seemed like someone other young women could have looked up to. "It bothers me that a woman was not successful. It bothers me that the women wanted to idolize her and that she fell. It bothers me that students thought she was great, and it bothers me about the patients. So I get disturbed," Gardner said. One of those women also disappointed by Holmes is Arriola, who was one of Theranos' early employees but left before the company moved into commercial blood testing. She has since moved on to become a general manager and partner at Microsoft but echoed Gardner's sentiment. "It hurts me to know that so many women, some of the female entrepreneurs, in the world believed in her and saw her as this world-changing individual, and all along I knew she was ethically corrupt," Arriola said on "The Dropout." "Was Elizabeth a sociopath? I think history speaks for itself." But Arriola hasn't given up hope that there will groundbreaking blood testing technology in the future. "Someday it will become reality -- just not with Elizabeth," she said. Joseph Fuisz, an inventor, entrepreneur and lawyer, was a Holmes family neighbor when they lived in Washington, D.C., during the late '80s and early '90s. He thinks there's a particularly sad irony to the fact that Gardner, whom he regards as one of the most brilliant scientists of our time, is in some ways the very groundbreaking female healthcare pioneer that he said Holmes just pretended to be. "Phyllis, while having kids and practicing medicine, was [a] chief scientific officer of ALZA [once a pharmaceutical and medical systems company], which was bought by Johnson & Johnson for $9 billion. They basically did all the original time-release technology. I mean, if you take a time-release tablet today, [there is a] very good chance it's from the technology that Phyllis Gardner worked on," Fuisz said. Fuisz thinks that Holmes was the type of person that the public wanted. "The press wanted youth and they wanted this sort of blonde hair, et cetera. And so they elevated Elizabeth. And Phyllis right away saw through the fallacy of what she was attempting to do with the technology ... but I always found it ironic and sad in a way, because to me, in a way, the press is building up Elizabeth for trying to be what Phyllis actually was," he said. To this day, neither Holmes, Balwani nor Theranos have admitted any wrongdoing. Holmes and her counsel did not respond to repeated requests for comment. Reid Kathrein, who represented investors in a lawsuit against Theranos, said Theranos should be held responsible for what he calls egregious misdeeds. "This is not a little thing," he said. "Not only did they fool the investors, they fooled the media, they fooled patients they fooled doctors." Coopersmith, Balwani's attorney, is optimistic about the upcoming trial. "I'm very confident that when the jury hears the whole story, you're going to see an acquittal -- in this case acquittals," Coopersmith told Jarvis. He also said that Balwani is focused on the future. "He's a very energetic, really brilliant person who has plans and dreams like all of us. He wants to continue to develop software," Coopersmith said. "I don't know whether it be in health care. He wants to continue the entrepreneurship that he's shown in the past." These days, Holmes is living in San Francisco and often seen walking her dog, Balto, a Siberian Husky she named after a famous sled dog who transported life-saving medicine across Alaska during a diphtheria outbreak in the 1920s. She may again be the last runner on the track, refusing to quit. According to sources, she's already planning a new company. It might even resemble Theranos. As she told a packed house at a Forbes conference three-and-a-half years ago: "You will get knocked down over and over and over and over again, and you win by getting back up. ... I would start this company over 10,000 times if I had to." "The Dropout" is a six-part series on the rise and fall of former Silicon Valley darling Elizabeth Holmes and her company Theranos. It is written and produced by Jarvis, Taylor Dunn and Victoria Thompson. Listen to "The Dropout" for free on Apple Podcasts, Google Podcasts, iHeartRadio, Spotify, Stitcher, TuneIn, the ABC News app, or your favorite podcast player.